If you like Japanese green tea, you may know Sencha, which is the most popular Japanese green tea. What about Shincha? Sounds confusing, doesn't it? Actually, they are the same kind tea. 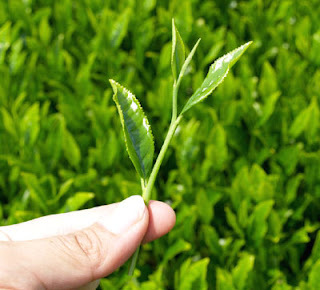 Shincha is the "spring Sencha” made by first flush. "Sen" for Sencha means ‘to decoct’ or ‘to extract essence’, and "cha" means tea. “Shin” for Shincha means ‘new’ or ‘fresh’. Japanese love fresh and seasonal stuff. Sushi is mainly made of fresh fish. The traditional dishes place an importance on season. So, we would love to give the special name to the new tea. Made from fresh and young buds, Shincha has more fresh and greenish aroma. Now, “tea nouveau” is everywhere here in Japan! *See about the tea special day "Hachijyu-Hachiya".